As one of many institutional partners committed to the ongoing development of better digital repository solutions for organizations across North America and internationally, University of Alberta Libraries [UAL] was recently elevated from a provisional to a full partner in the Hydra Project. Hydra is open source software developed through the collaborative efforts of a number of partner institutions, including the University of Alberta. Check out UAL’s code for HydraNorth and other projects on Github! University of Alberta Libraries will be running a Food for Fines campaign at all library locations from Monday, February 1 - Sunday, February 14, 2016. A partnership with the Campus Food Bank, all donated food items will be distributed to members of the University of Alberta community through the Food Bank on North Campus and the Reciprocity Shelf in the Forum at Augustana. 2. Donate non-perishable food items. Preferred items include rolled oats, rice, canned vegetables and canned beans. However all non-perishable contributions are welcome. 3. For every item donated, you will be waived $5 in overdue fines, to a maximum of $100 [20 items]. Only current fines on UofA books and books from most NEOS libraries will be waived. Charges for lost or damaged books are not eligible. No fines? No problem. Donate a food item anyway. UofA Libraries, in collaboration with Unwind Your Mind, will once again be welcoming therapy dogs from the Chimo Animal Assisted Wellness and Learning Society (CAAWLS) to four of our north campus libraries (Rutherford, Cameron, John W. Scott Library and the Education Library) this term. Pet therapy is a fun, enjoyable way to decrease feelings of loneliness and anxiety. Therapy dogs are wonderful listeners, love meeting new people, and are happy to indulge in a cuddle. Take a break from your work and studies and spend some time with these canine therapists. Librarians at the University of Alberta Libraries are active practitioners who through the course of their work often develop new and interesting methods and start new initiatives that are widely recognized. 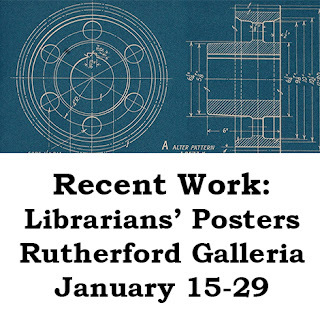 To share some of this great work, the Libraries is hosting an exhibit of librarian conference posters from the past two years at the Rutherford Library from January 15-29th. These posters showcase the variety of knowledge University of Alberta librarians have to share, from original research-generated contributions to lessons learned through practice and project-based innovation. The exhibit includes posters that were displayed at conferences such as: The International Academy of Nursing Editors Annual Conference, 8th International Evidence Based Library and Information Practice Conference, Open Repositories 2015 and the Art Libraries Society of North America Annual Conference, to name just a few. You can see the full list of posters and authors at the bottom of this post. Please do take the time to wander through Rutherford Galleria sometime in the next two weeks to view this work. 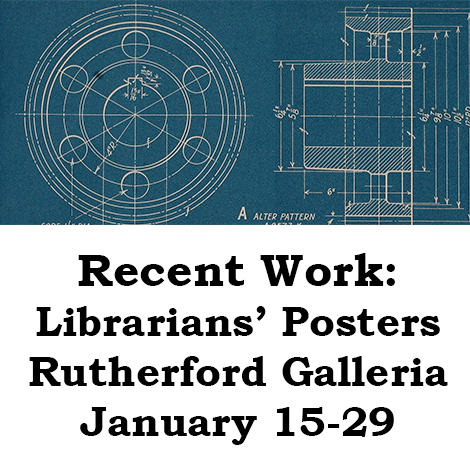 These posters show our librarians' commitment to sharing their knowledge with the greater community.